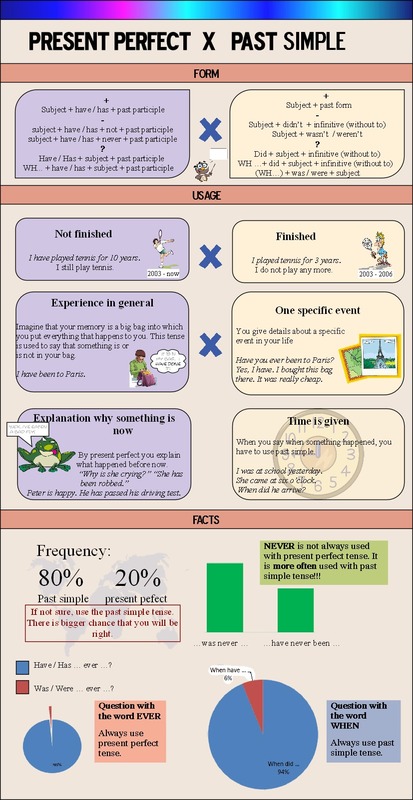 Many students find the difference between present perfect tense and past simple very confusing. To help them I have created the following infographic. Here you can practise the difference between present perfect simple and past simple tenses by playing some games. The first game is called Fling the teacher and you have to choose the correct option 15 times to win the game. You have to choose between present perfect simple and past simple tense. Good luck. Hoopshoot game to practise present perfect and past simple. The last game is a quiz. Complete the gaps with present perfect or past simple tense and if you score more than 80% you will get to play a game called Angry Finches. Enjoy the game!!! BUT – I always wonder WHY it “has” to be written in English, once people are STILL LEARNING. I am definitely AGAINST the theory that explanations are better in the Language that is being taught. Just “think”, [if possible] learning German, Russian, japonese!!! !/ Arabic,hahaha. Can you catch now???? I have Full Degree, so this is [NOT and NEVER] simply a point of view. An [obvious] thing, just it. Although I knew those gramer,learned more,thank you.